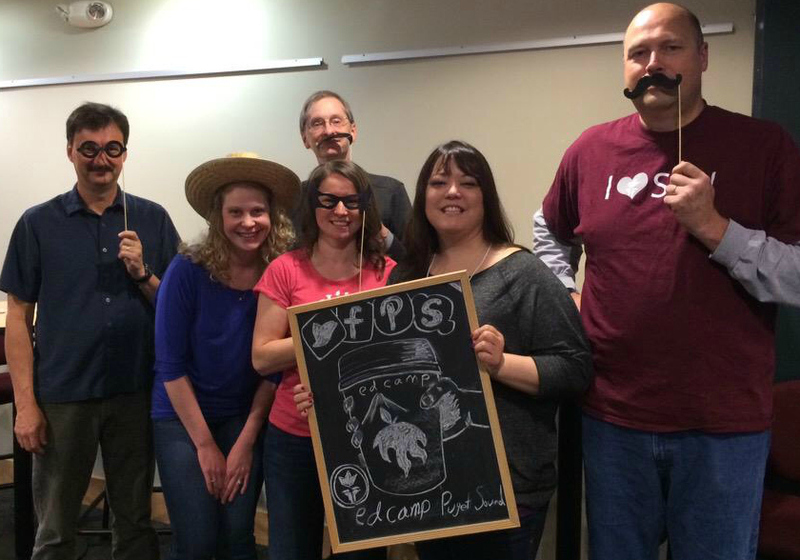 The Spring Edcamp Puget Sound was held at the Puget Sound ESD on Saturday, May 16, 2015. An Edcamp is an opportunity for teachers at all levels to come together to discuss ideas about teaching and learning that can help improve their practice. Think of it as a free day of professional development for teachers where they get to decide what to learn about. In the rest of this post I will describe my experiences at the Spring Edcamp event with the goal of giving you a better idea of what to expect if you decide to attend an Edcamp. After checking in, teachers walked into the main meeting room where PollEverywhere’s word cloud feature was used to find out what topics teachers wanted to discuss during this unconference. If you are unfamiliar with word clouds, the basic idea is that the more times a word is used in a response the larger the text will be. Teachers used their laptops or mobile devices to enter topics they wanted to talk about. 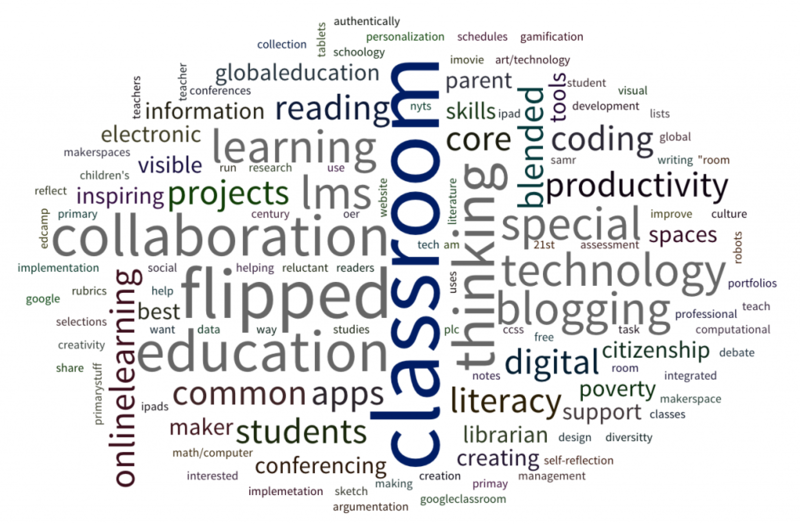 Notice in the word cloud below that words like “classroom” and “thinking” are large but lack context. This process of identifying what teachers wanted to talk about may have worked better if teachers were given a list of topics to choose from rather than an open prompt. A Google Doc was used to organize sessions. Committee members asked questions to help determine what teachers meant when word cloud terms lacked context. A schedule was agreed upon in less than ten minutes which allowed time for a quick ice breaker before the first session. Teachers decide which sessions they will attend and can leave the session if they decide it does not meet their needs. Sessions usually have a volunteer facilitator and this person should make sure that the focus is discussion rather than presentation. The three sessions I attended were 1) Blogging, 2) Data Collection Tools, and 3) Coding, Robots, and 3D Printing. During the blogging session we discussed appropriate tools, privacy, and whether to have a class blog or individual blogs. First #edcamppswa session of the day #blogging. Discussing class vs individual blogs. Thoughts? The second session I attended was on data collection. We discussed which digital tools teachers are using to collect data and found out that many are using paper forms. Those who said they have attempted to use digital tools have been discouraged from doing so because of privacy issues. We discussed coding, robotics, and 3D printers in the third and final session I attended. A recurring theme during this session was how to help students learn through failure. One suggestion was to design the assessment rubric so that a heavier emphasis is placed on process rather than product in order to help students understand that there is great value in the journey. For example, focusing on process may help students writing code to see the importance of understanding what each line of code is for rather than copying and pasting someone else’s code just to finish the project. 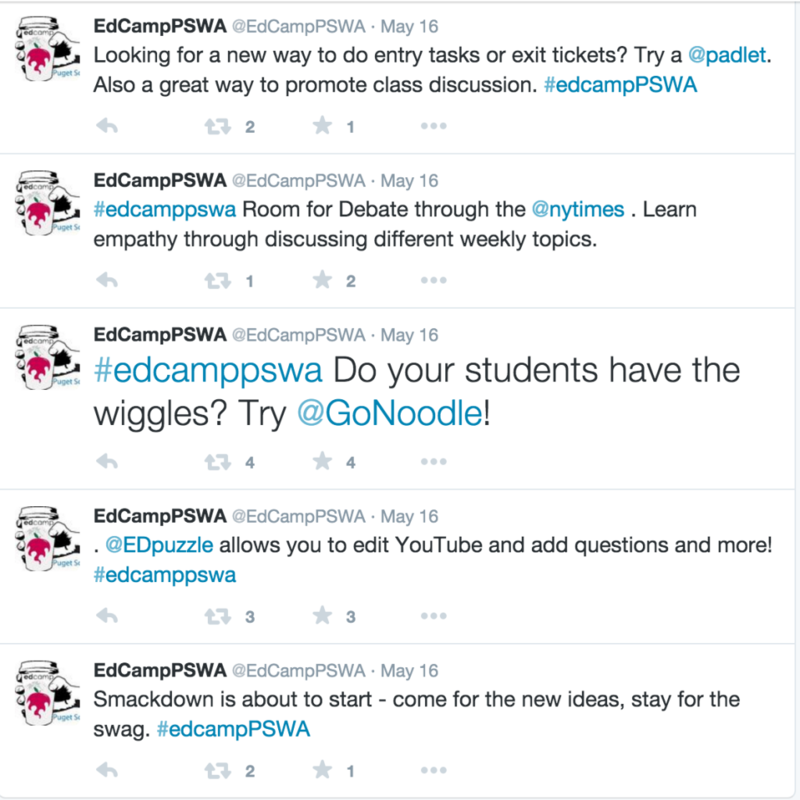 Talking #coding @ #edcamppswa – How do we get students to move beyond copying & pasting to actual #computationalthinking? The big giveaway was a free conference pass to the 2016 NCCE Conference worth $350. Thanks @techsavvylib! I hope to learn with you at an edcamp in the near future like the one at SPU on November 14, 2015. Thanks for reading!